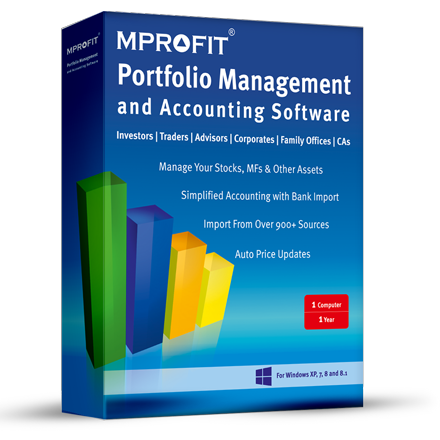 MProfit has introduced an accounting module that seamlessly integrates with the portfolio management section. Now there is no need to maintain two transactions, one in a portfolio management software and one in a separate accounting software, with MProfit it’s now simplified. Integrated accounting with automatic posting of entries from the portfolio management module such as Dividend pay-out, Dividend reinvestment, Interest Income, capital gains and F&O profit/loss. The Journal vouchers, payment and receipt vouches entries are auto-generated from stocks, mutual funds as well as F&O transactions and posted in respective ledgers in accounts. JVs from brokers contract notes and entries are posted in respective ledgers such as broker’s ledger, capital gains. Import your bank statements to maintain your bank and cash accounts. Easy to understand Balance Sheet, Profit/Loss Statement and Trial Balance reports.